After breakfast, we packed our stuff, cleaned the rooms (saved about $50 cleaning fee), loaded the car and started driving towards Nusfjord soon after sunrise. First stop was at a fishing pier just outside of Ramberg. Next stop was at the lake Storvatnet which was on the way to Nusfjord. For the first time in Norway, we saw a little bit of the blue sky. There was hardly any traffic. We stopped a few turnouts on Fv807 around the lake to enjoy the scenery and take pictures. Although it was close to 11am, the sun was at low angle in the Arctic Circle, the light was golden. 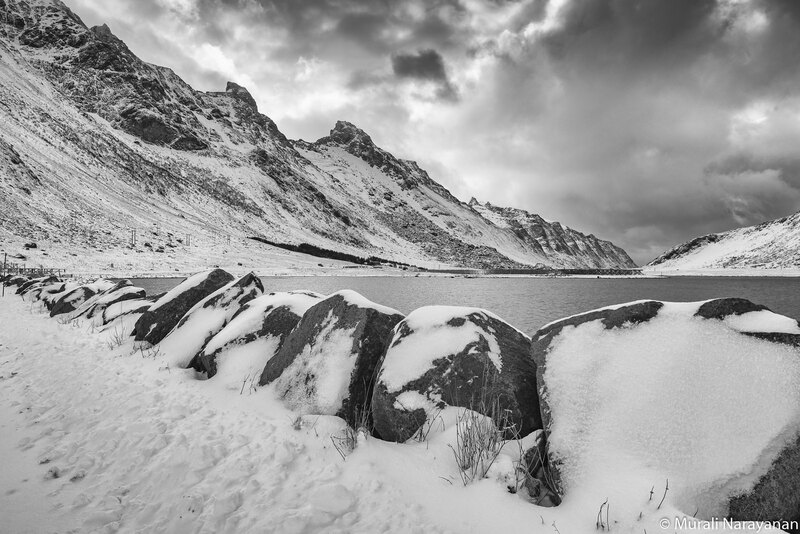 In fact, I found the best time to do photography in Northern Norway in mid to late February is between 11am and 2pm!!! 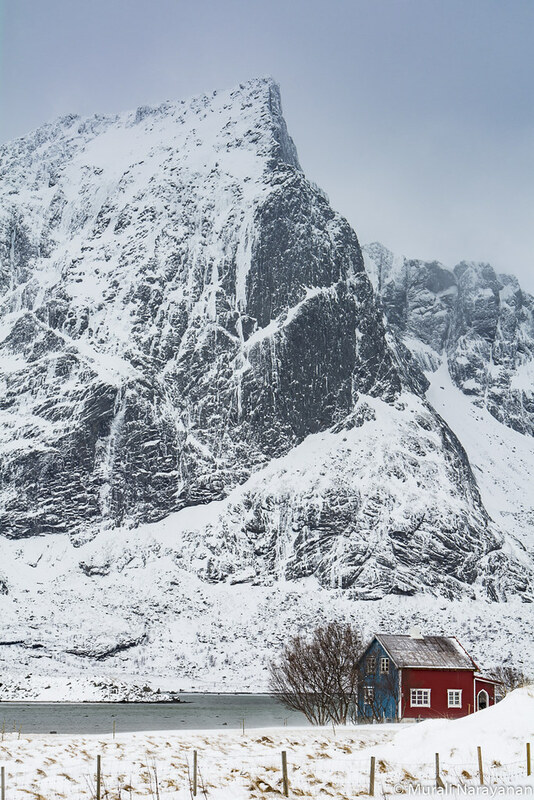 We reached the beautiful fishing village of Nusfjord at around noon. 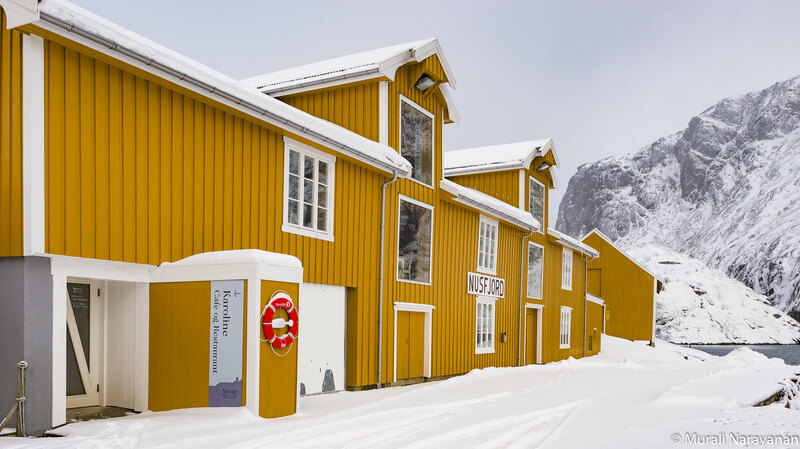 It is one of the oldest and best-preserved fishing villages with long Lofoten fishery traditions. The population is about 70 per the checkout clerk at the cafe. It has beds for about 200 people in the rorbuer and 2 restaurants. 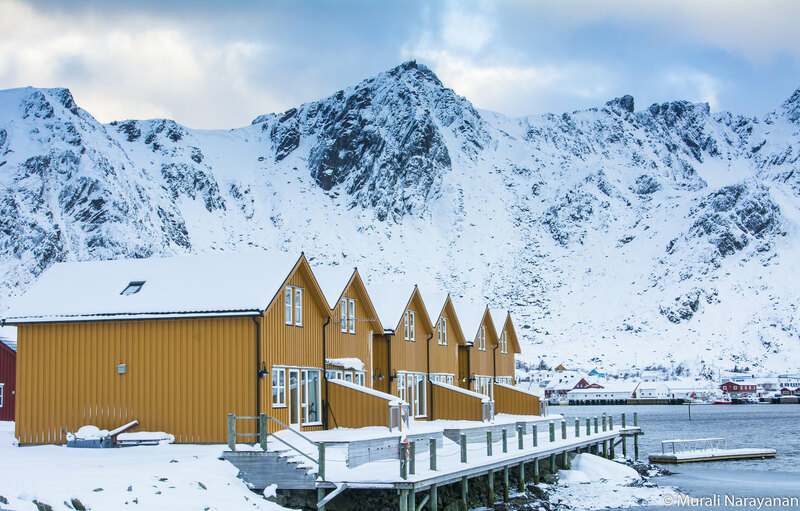 In winter very few tourists visit the village but in summer, about 5,000 show up. We had coffee and hot chocolate and chatted with the clerk and her mom who was visiting from Southern Norway. After a short break for usual lunch in the car, we started driving north again towards Ballstad and snow showers and high winds picked up. 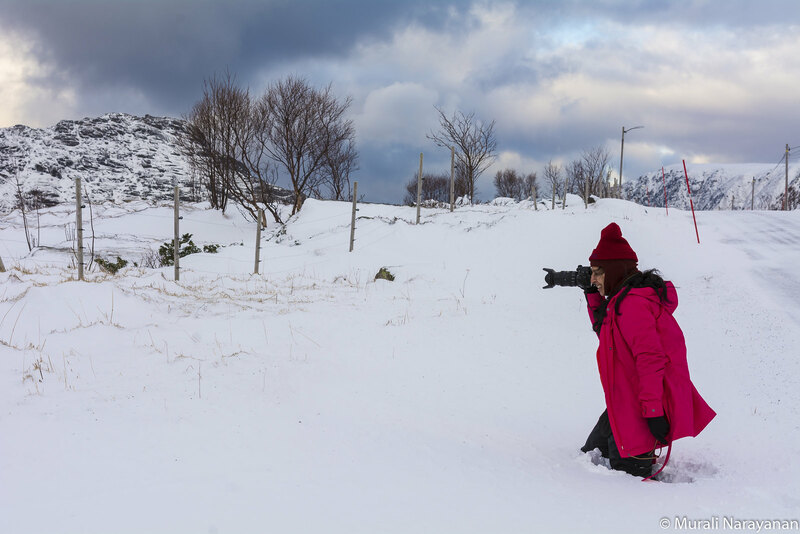 Revathy was seriously shooting images without realizing that she was in a ditch with snow up to her waist. Getting back to the road was a bit of a challenge. Allz well that ends well. 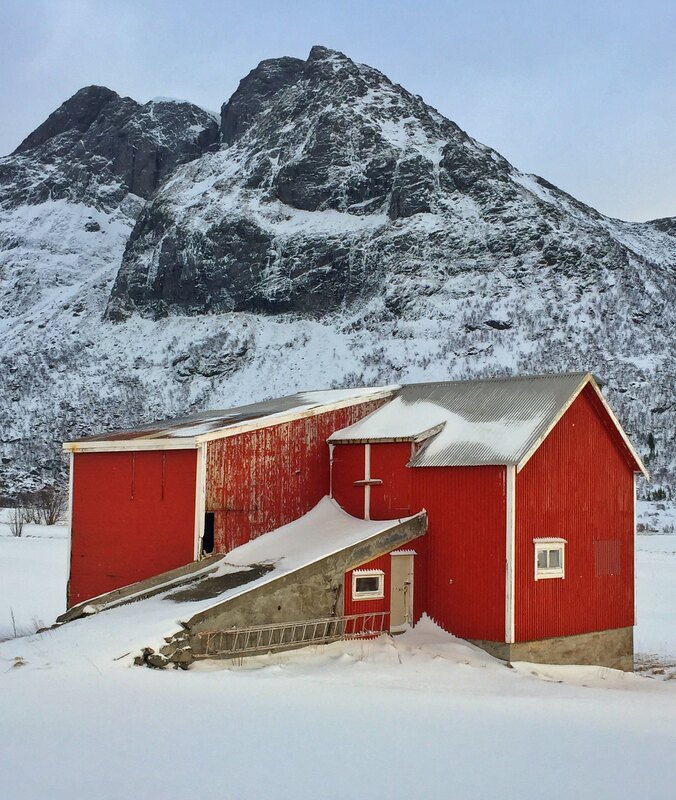 Along the way to Ballstad, we came across a bunch of farmhouses. Below is a typical one. The ramp in the front of the house leads to a loft. In one house, we saw a car parked inside. 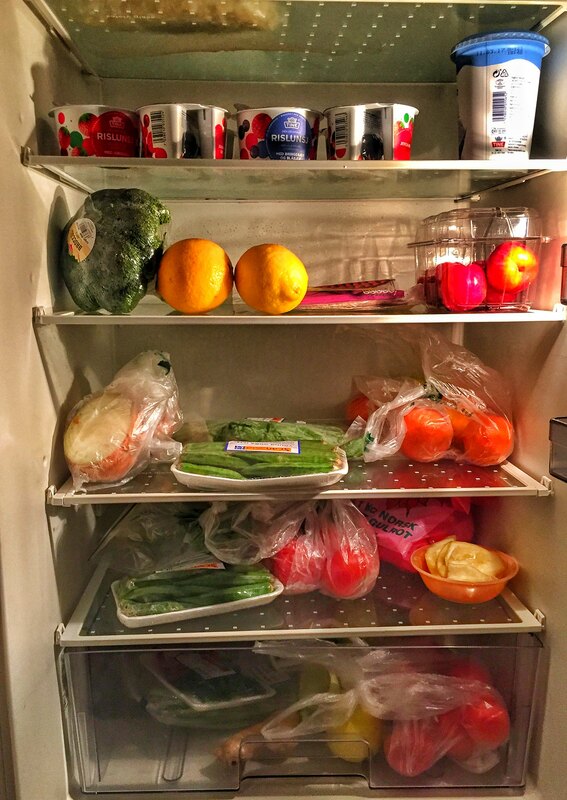 May be they also store grains or other items in it. We reached Ballstad at around 3pm. 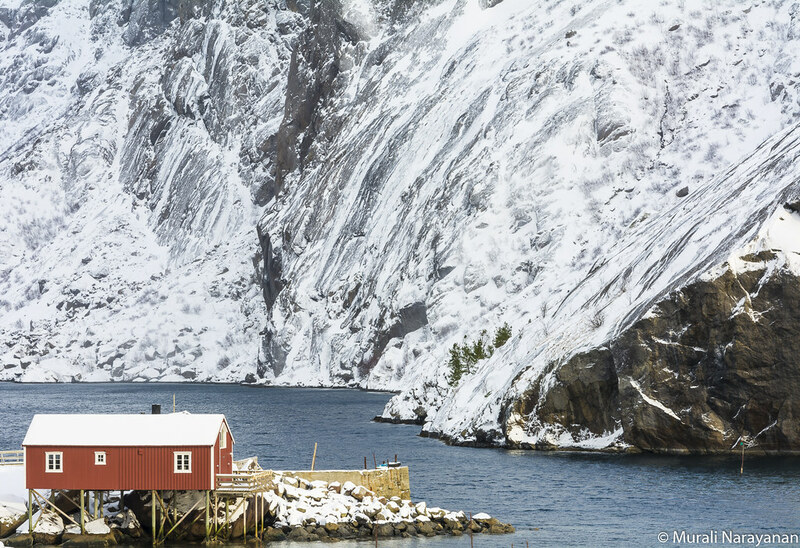 It is a large fishing village situated near the mouth of Buksnesfjorden, where it meets Vestfjorden. As the local school had just closed, we saw a bunch of kids on cross country skis or sleds trekking to their homes. We located a group yellow houses by the road in front of Skottinden mountain. We stopped at a marina nearby and shot a few pictures of the homes. We stopped at the only grocery store in Ballad, the Joker to grab some groceries and headed back to Leknes. Susheela, who had come to the tough realization that she needed better woolen gloves, grabbed a few in the Leknes shopping center while Dash and I picked up a bottle of Norwegian Vodka and grape juice. We then drove to our apartment, Lofoten Rorbuopplevelser, just outside of Leknes where we stayed for 3 nights. We were met by the super friendly owner of the apartment who showed us around. 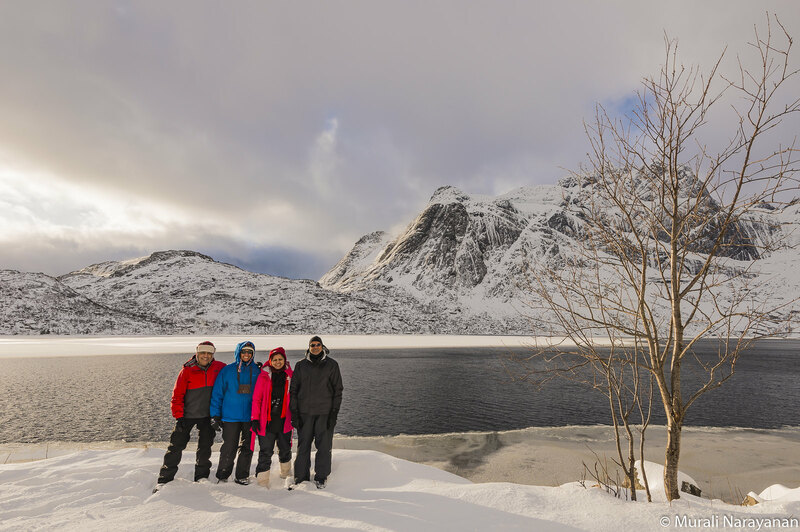 We unloaded the car and loaded the refrigerator with the groceries we had picked up along the way and the leftovers from the Hamnoy rorbu. First opportunity to wash clothes. Yes, the apartment had a washer & detergent. We all took turns to get or clothes washed and dried the clothes on the racks and on top of furniture. 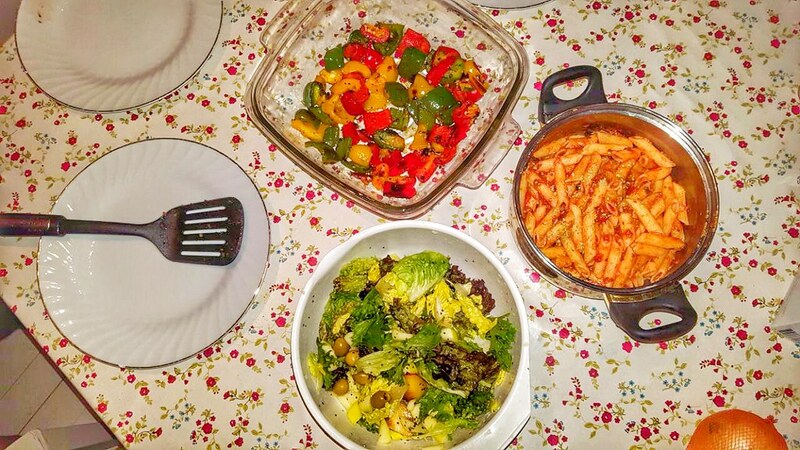 Dash, Revathy, and Susheela prepared pasta and 2 different salads for a nice dinner. A glass of vodka was also a welcome add-on. Aurora Borealis forecast for that night was unfavorable. We hit the sack after fishing emails, FB and WhatsApp postings.